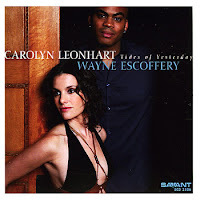 Tides of Yesterday - Carolyn Leonhart with Wayne Escoffery (Savant) - This is the second full recording by the married couple (they tied the "knot" in 2006), featuring a similar lineup to 2008's "If Dreams Come True" (Nagel-Heyer), with Donald Edwards on drums (instead of Jason Brown or Carl Allen.) Ms. Leonhart has a fine, flexible, voice, she inhabits lyrics fully and there's a soulful edge to her readings. Highlights include the double-edged take on Richard Rodgers' "The Sweetest Sound", a track that starts with a long, slow, voice and guitar (Adam Rogers) intro before heading into hard-bop with strong solos from Rogers and Escoffery (on tenor.) "Never Never Land" is a truly pretty tune with a sweet vocal and atmospheric tenor sax. "The Harbor (Poppy's Song)" is an original tune (music by Joe Martin, lyrics by Leonhart) and has a Latin feel, sparkling piano from Todu Dodo and "popping" percussion from Edwards and guest Jeff Haynes. Escoffery moves to soprano sax and Rogers to acoustic guitar for sweet take of Charles Mingus's "Eclipse." Tenor and voice open the fiery version of Lee Morgan's "Infinity" that closes the disk. The duo stay together on the melody line before moving aside for Dodo's driving solo. They dig deep into "Big Noise, New York", written by Donald Fagen (from Steely Dan, the group that Ms. Leonhart sings background vocals on the band's post-Millennium releases and on tour.) It' a smoky, bluesy, ballad with great drumming from Edwards, a funky electric piano solo and fiery tenor sax but it's Ms. Leonhart's soulful vocal that enlivens the tune. She and Dodo create a contemplative setting for their duet on "You Must Believe in Spring", a rendition without a wasted note. There's not a weak track on this fine recording and it's the sort of program you can put on repeat. Escoffery plays with great fire and also shows quite a melodic side. The rhythm section is tight and responsive. Ms. Leonhart is part of the band, she's an articulate vocalist (no lyrics lost to "showboating") with good musical instincts. For more information, go to www.carolynleonhart.com or www.escofferymusic.com. 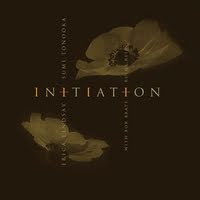 Initiation - Erica Lindsay and Sumi Tonooka (ARC) - This fine collection of original tunes (5 each by Ms. Lindsay and Ms. Tonooka) continues to grow on me. The music is fairly "straight-ahead" but not "neo-con", with blues influences in both composers' works - best part is that it's not just a "blowing" session. The songs have complete melodies, the solos grow logically out of the thematic material, and everyone plays well. Ms. Lindsay, who works with Bakaida Carroll, the Oliver Big Band and is on the faculty of Bard College, is a gutsy tenor saxophonist and her compositions show an affinity for the music of John Coltrane. Ms. Tonooka, a native of Philadelphia, has worked with Kenny Burrell, Little Jimmy Scott, Red Rodney, Benny Golson, and David “Fathead” Newman while maintaining a busy solo career for the past 2 decades. Her longtime collaborator Rufus Reid (bass) and the late Bob Braye (drums, who passed in 2007, 3 years after this session was recorded) make up the solid rhythm section. "Initiation" is 70+ minutes of mature creative music that is quite joyful and rewarding. Recorded nearly 6 years ago, the music is fresh and impressively devoid of cliche. To find out more, go to www.ericalindsay.com or www.sumitonooka.com. 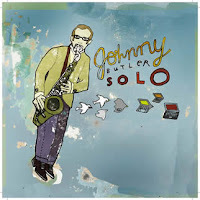 Solo - Johnny Butler (Johnny Butler Jazz) - Don't much about Mr. Butler or his music (he plays with an electric 5-some known as Scurvy) is a fascinating experience. One saxophone and a looping system, this EP (just over 24 minutes) was recorded live without overdubs in various studios and 1 track from NYC's Otto's Shrunked Head Tiki Bar & Lounge. To find out more about this man and his music, go to www.johnnybutler.com. Curiosity - John Vanore & Abstract Truth (Acoustical Concepts) - Here's an interesting that's been sitting unreleased for 19 years. Trumpeter/composer/arranger Vanore, based in Philadelphia and an alumnus of the Woody Herman Band, created a book for a 13-piece band including 5 trumpets, 2 trombones, a french horn, 2 saxophones, piano, bass and drums. The title track literally burst out of the speakers, flying atop Joe Nero's flashy, splashy, drum work. The ensemble takes its name from Oliver Nelson's most famous Impulse recording, not so bluesy as mainstream. He composes strong melodies, the boppish "Misdemeanor" with its Latin influences as well as the lovely ballad, "Return", arranged for a quartet of muted trumpet (Vanore), piano, bass and drums. Frank Foster's pretty "Simone" shows off the intelligent brass arrangement and features a hearty tenor sax solo from Mike Falcone, who also contributed the McCoy Tyner-like "Dream Dancing", its fine melody rising out of the saxophones. Can't forget the contributions of pianist Ron Thomas, whose solo and ensemble work is impressive. One must assume the vagaries of the record business kept this lively session under wraps since 1991. It will finally be released in April of this year and, if you like high-flying brass and strong arrangements, this disk will satisfy your curiosity. Rating: triple! 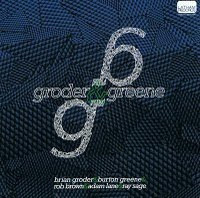 Groder & Greene - Brian Groder, Burton Greene, Rob Brown, Adam Lane, and Ray Sage (Latham Records) - Trumpeter/composer Brian Groder has played with artists such as saxophonist Billy Harper, guitarist Rez Abbasi, Joe Cocker, in house bands at clubs in Atlantic City, is in the trumpet section of the John Vanore CD reviewed above and recorded his last CD with Sam Rivers. That 2006 release, "Torque", received great critical acclaim and deservedly so, for its rich textures, smart soloing and strong compositions. This CD is mostly "collective works", with only one composition and, due to the fine musicianship the quintet makes it work. The pieces are fairly long (all but one over 7 minutes) yet there are relatively few moments when the energy flags. Alto saxophonist Brown is a fine creative player, with an innate ability to blend funk and fire, melody and sound. Bassist Lane, like the rest a strong composer, is solid here with thick tones mingling with rapid-fire riffs. I've not heard drummer Ray Sage before but his playing is, at turns, sympathetic propulsive and fiery. Pianist Burton Greene has been involved with "avant-garde" music since the 1960s but also plays classical, klezmer and more. His style is definitely his own, quite rhythmical, not so much harmonic as melodically fragmented. Upon initial listen, one might feel his solos meander a bit but, when you listen closer, you can tell Greene is reacting to and interacting with the other musicians. Groder has a clear tone, great attack, and solos with authority. My issue with the program is that it's too long (75 minutes) and, while each track has something to commend it, there is too much music for one sitting (watching and hearing "instant compositions" can be different.) To that end, this is a solid double. For more information, go to www.briangroder.com. 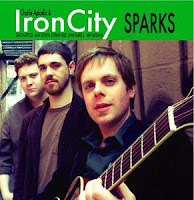 Sparks - Charlie Apicella & Iron City (CArlo Music Records) - Iron City is what one might fondly called a "bar band." With a burbling organ, crisp guitar, funky drums, and a repertoire that mines soulful pop and jazz music, there are plenty of sparks. Apicella's guitar work hearkens back to Grant Green, Wes Montgomery, early George Benson and he's a thoughtful, economical, soloist. Tenor saxophonist Stephen Riley adds his smoky tenor on 5 of the 8 tracks while John Blake adds a killer violin solo to Don Covay's "Sookie, Sookie." Amy Bateman's violin work on the original "Sweet and Sounded" is lively. There's even a sensuous romp through Michael Jackson's "Billie Jean." Yet, it's the intuitive interplay of the guitarist and Dave Mattock's B-3 organ (great foot work throughout) that gives the music its energy. Drummer Alan Korzin rounds out the group, a solid percussionist who holds down the rhythm section and doesn't push too hard. "Sparks" is pleasing but not essential music, the sort of program that works well in a live setting but loses a bit when put on disk. To get a taste, go to www.ironcityjazz.com. Rating: double. 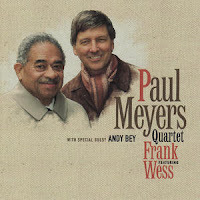 Paul Meyers Quartet featuring Frank Wess (Miles High Records) - Guitarist Meyers is a creative sort, playing a program of (mostly) standards on acoustic nylon string guitar in a quartet session with saxophonist and flautist Frank Wess. Bassist Martin Wind (always melodic and supportive) and drummer Tony Jefferson (a light touch as befits the sonorities of the group) round out the ensemble save for one track with vocalist Andy Bey. Messrs. Meyers, Wess, Wind and Jefferson have created a sweet concoction that goes down like a glass of fine port. Mature, aged to perfection but sassy enough to make one want more. For more information, go to www.paulmeyers.info. Three's Company - Bill Cunliffe & Holly Hofmann (Capri Records) - Beauty should not be overlooked as a reason to enjoy music. For some, a roaring tenor sax or buzzsaw guitar can be aurally orgasmic but, for this reviewer, a pianist who understands that blues can be joyous is quite enjoyable. The opening track on this disc, "Too Late Now", is a track to behold. Cunliffe's glorious left hand and active right hand, mixed with Hofmann's sweet and lowdown flute is worth repeated listens. The other duo tracks are Faure's "Pavane" and Cunliffe's "Dalto" and "Farewell." The sweet Latin feel of "Dalto" leads one to believe that Cunliffe wrote this in tribute to the Argentinean pianist whose tragic passing at the age of 39 (in 1987) robbed the music world of a great player and fine composer. Cunliffe's highly rhythmical yet richly melodic lines really capture the spirit of the person to whom the piece is dedicated. Guest artists include violinist Regina Carter, clarinetist Ken Peplowski, trumpeter Terell Stafford and drummer Alvester Garnett. Carter and Hoffman open "Star-crossed Lovers" with stunning interwoven lines - when Cunliffe enters, the piece becomes ever-so-slow and contemplative. Stafford's trumpet and Hofmann's flute in unison on the boppish title track makes for a bright and bouncy piece while Garnett's sprightly brush work give both the flautist and pianist a sweet cushion for their romp through "Sweet Andy." "Reunion" adds the clarinet to the mix and the contrast of Hofmann's high tones with the burnished woody sound from Peplowski plus Cunliffe's melodic work make this track another high point on the collection. "Three's Company" (and Two's pretty darned comfortable as well) is the 5th time Holly Hofmann and Bill Cunliffe have recorded together. Their musical interaction on this CD is impressive and quite musical. There are moments that remind this listener of Jan Garbarek & Art Lande's classic "Red Lanta" recording (ECM, 1974) but this has more blues and joy. To find out more, go to www.hollyhofmann.com. 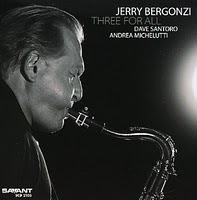 Three for All - Jerry Bergonzi (Savant) - Here's an impressive trio + date from the fine tenor saxophonist and educator. "+" refers to the fact that the leader overdubs soprano saxophone and/or piano on a number of tracks. Even though Bergonzi adds other sounds to the trio, the interaction between he, bassist Dave Santoro and drummer Andrea Michelutti sounds organic and alive. The main reasons for that are 1) - the trio has worked together extensively and 2) - Bergonzi writes songs with good melody lines and not just "riffs." Cuts like "Bluebonics" with its melody played on both saxophones and with piano chordal backing and "Tectonic Plates" stand out not because of a gimmick but for their richness. That does not mean the trio cuts are dull - oh, no way. "Obama" brings to mind the best work of mid-50's Sonny Rollins while "Fidh" thrives on Santoro's full bass sounds and Michelutti's crisp drum work. Through it all, Jerry Bergonzi's tenor playing is muscular and musical, filled with ideas, at times conversational but never just "blowing for blowing's sake." The rhythm section couldn't play better and bassist Santoro gives good support, plays intelligent counterpoint and is a strong second soloist. Michelutti keeps everyone in line without being a strict timekeeper. "Three for All" is good music that grows with each listen and makes one want more. For more information, go to www.jazzdepot.com. "Out 'n' In" does a fine job delineating the influence Dolphy had in his short time on the scene. Using his classic Blue Note CD as a jumping off point, many of the pieces have that spare, open, sound the 1964 Lp displayed. The band plays "Hat & Beard" and "Gazzelloni" from the recording, Siegel's bass clarinet leading the way on the former along with Wright's interpretation of Bobby Hutcherson's brilliant work while the latter steams along on the crisp rhythm work of Falmer and Forbes. The drummer really pushes the proceedings with crisp ride cymbal work. "A Conversation" is just that - Facey and Siegel (on tenor) improvising in the manner of Dolphy and John Coltrane, wrapping themselves around a riff. The handsome ballad "A Bitter End for A Tender Giant" begins as a dirge but moves into a longer section where the bass clarinet, vibes and alto weave a hypnotic and melodic spell. "Dolphyus Morphyus" is a through composed work that builds off of Dolphy's riff-inspired melodies and conversational solos. Nearly 11 minutes long, the energy and invention never flags. The closing track, "Bowden Out", is another ballad, with more stand-out work from Wright and horn lines that hint at both classical and blues melodies. 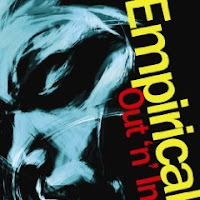 Empirical's self-titled debut 2007 CD was a swinging affair that showed the group was still digesting influences and striving to forge its identity. Replacing the piano with vibes changes the dynamics and, although the music is proudly steeped in the work of Eric Dolphy, Bobby Hutcherson and Charles Mingus, one can hear that this young band has grown impressively in the last 2 years. For more information, go to http://empiricalmusic.com. 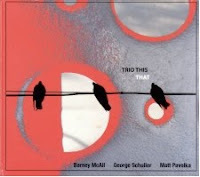 That - Trio This (GM Recordings) - This is a pleasing collection of tunes ranging from melodic originals from pianist Barney McAll, fascinating trio explorations from drummer George Schuller, and smart covers. Bassist Matt Pavolka rounds out the ensemble and is the "rock" of the band, allowing Schuller to really explore his drum kit and play with the rhythms. What stands out are the handsome melodies, not just fragments to play once and then move int extended solos. Even funky excursions like Les McCann's "Get That Soul" has a good melody line. McAll feels really comfortable in ballad settings so pieces like "Flashback" (an original) and Henry Mancini's "Dreamsville" are allowed to move easily, at their own pace, without loading on gratuitous solos. Even Wayne Shorter's "Pug Nose" (one of his earliest pieces) lopes along at an easy pace, swinging nicely over Pavolka's walking bass and Schuller's sensitive brush work. "That" is good music, good listening, an intimate session of like-minded players having fun creating a memorable experience. Ease into it and allow the sweet sounds to take hold. For more information, go to www.myspace.com/triothis. Antibes - Greg Reitan (Sunnyside Records) - A friend thought that this music sounded like the Bill Evans Trio work from the early 1960s. A nativ of Seattle, Washington, Reitan has a gentle touch, a propensity for melody, and a calmness in his approach similar to that of Fred Hersch. Not to say that this music is all stillness and soft candlelight (Reitan's "One Step Ahead" opens with great intensity before bassist Jack Daro slows the pace with his solo spot.) Mostly, the program is ballads or medium-tempo tunes - drummer Dean Koba is a real asset, playing with intelligence and smoldering intensity that makes pieces like the title tune glisten and dance like candlelight in the breeze. There's a refreshing classical music influence on the title track and, juxtaposed with walking bass lines and shimmering cymbal work, is a smart entry to Reitan's musical world. "Salinas" sparkles with a lilting piano line and a propulsion from the bass and drums that ebbs and flows organically. Reitan's touch is skillful, crisp, he knows when to hold back and when to surge forward and does so without sounding clumsy or forced ("September" is a perfect example of his intelligent work.) The version of "In the Wee Small Hours of the Morning" that closes the program is truly lovely. "Antibes" is Greg Reitan's second CD with his Trio and, like the first, is worth exploring in depth. To find out more, go to www.myspace.com/gregreitan. 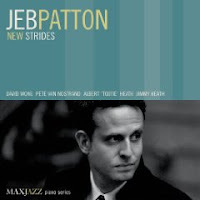 New Strides - Jeb Patton (MaxJazz) - The first word that comes to mind when listening to "Billy", the opening track of pianist Patton's 3rd CD s a leader, is joy. The song sounds so bright, so light and bouncy (but not cloying) that it's tough to resist. Bassist David Wong and drummer Pete Van Nostrand swing with great zeal, yet never overpower the leader. The venerable standard "My Ideal" has a similar light-hearted feel and, truly, that permeates the entire program, even in the tender and bluesy reading of "Last Night When We Were Young", a duet with Jimmy Heath (playing soprano saxophone.) Albert "Tootie" Heath appears on 3 tracks (Patton sits in the piano chair of the Heath Brothers Band) and really spurs on the pianist and bassist. Jimmy Heath's "Cloak and Dagger" is a bluesy romp with a spirited drum exchange while the original tribute to fellow pianist Roland Hanna "Sir Roland" displays "Tootie's"great knack for laying back and then pushing hard (when need be.) Patton's two-handed solo is a true delight. Perhaps the only misstep (to my taste) is the hard-bop romp on "If Ever I Would Leave You" - the trio plays just fine but the emotional intent of tune seems muted. Other than that, "New Strides" is easy to take. For more information, go to www.jebpatton.com. This CD packs a lot of music in its 37 and 1/2 minutes. Dave King is more than the rhythmic drive behind several groups; he has a lot to say and has given listeners plenty to digest. For more information, go to www.sunnysiderecords.com.